Historical proof of Mecca existence B.C. Do we have some early, historical report which can prove that Mekka existed before Christian era ? Actually I have found an obvious proof, but I need first to know how Muslims explain almost completely lack of evidences dealing with the historicity of Mekka. Re: Historical proof of Mecca existence B.C. The Lack of evidence is due to how backwords the arabs were,most of them didn't know how to read,or write they could only speak,and they used to live in hot deserts with barely any stone/tablet to write on like they did in those times. your reasoning is nice and quite logic, but it does not change the fact that there are many ancient records and documents from North Arabia with no mention of Mecca ? Thus, the explication of the lack of evidences (except very few records) from my point of view remains still problematic. I didn't read the entire article anyway, but maybe you or other brothers will notice something that I've overlooked. Jazakum Allahu khayran for every kind of your efforts. Actually I have found a little bit of proof,Diodorus Siculus recorded the Ka'aba's Existence. but the rest explains that Not many populations were in Ka'aba but Ka'aba is often REFERENCED TO in ancient literacy,the ka'aba used to have different red,blue,etc colors on it before the Muslim empire's recolored it to its brick like-color we know it as today. And this is in PSALMS a old testament notice it says the "Sparrow hath found a house"
the commentators say this is Jerusalem but there is no ancient Jewish literature describing a place in Jerusalem called "Bakkah"
so indeed this is the ka'aba,and an irrefutable proof that Abraham built it. I know all about of those informations you've posted brother. Maybe you right, since Mecca was covered by mountains and it has not too much population, perhaps this argument would justify why there are so few historical witnesses to its existence. In regard to our topic, there is a powerful proof that Mecca has already existed as a city in the time of revealing the Torah to prophet Moses (pbuh). Other scholars also shares a similar view. This of course explain why rabbi Saadia Gaon has mentioned Mecca and Medina in Genesis 10:30. This is not only his paraphrase concluded from the context as some might think, because if you go to the Hebrew text you will notice there such word as באכה (baka) which was translated as “as thou goest” ! On that occasion it must be stressed that the Hebrew משׁא (Mesha), that preceds באכה, does not stand here for Mecca as some of you would suppose. Lexicons says that this word is of foreign derivation, and there is no consensus as to whether it refers to a place somewhere in Arabia, or to a region, or to a north Arabian tribe. In any case, we have to concentrate on באכה (bakah), and it would be quite preferable to remember this word in its exact Hebrew form for the next portion of information’s. Reference: The Asatir: The Samaritan Book of the Secrets of Moses, together with the Pitron or Samaritan commentary and the Samaritan story of the death of Moses, introduction, translation and notes by M. Gaster, Ph.D. (London: The Royal Asiatic Society, 1927), p. 262. Notice the same word באכה (Baka) which can be found in the Hebrew text of Genesis 10:30 ! 2. Rabba = from rabb which means in arabic "The Lord"
I believe this is the answer, because if Ptolemy by saying Makorabba has in mind a temple rather than a city it would make sense in relation to what we have just read, i.e. 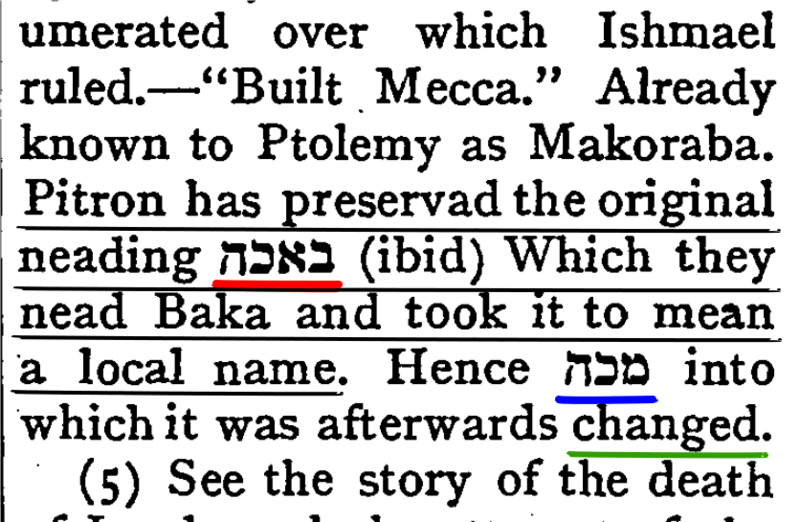 that Mecca according to the writing on maqam was called a “holy house of God”, and in result this perfectly fits the conception about Ptolemy’s Makkorabba as “The Lord of Mekka”. Some scholars also have proposed the translation “The Temple of the Lord” which again leads to the same point. Anyway, in conclusion we have at least two strong proofs directly from an ancient source showing that Mecca is a historical location and indeed existed long before Christian era, and as it is testified by ancient versions of Torah. The Christians of course will try to deny their authority as usually. Thanks brother Abdullah Almadi, I have read this article before, but frankly for me those various quotation are merely agreements of contemporary scholars and that's all. The real, historical proof is that one I've discussed above. Of course the documents from Ptolemy, Diodorus and other ancient geographers are also a historical evidence, but are not so clearly expressed about Mecca, in contrary to the two sources which I've presented in this post. By the way, brother Osama, the title of this thread should be changed to "Historical proof of Mecca existence B.C." and insha'Allah perhaps will be a new findings. Done, dear brother Idris. May Allah Almighty bless you, akhi. thank you dear brother Osama, I was thinking also that it will be better to preserve those images from being lost, exactly like you have made it with my previous images from the post concerning DSS corruption, remember ? I forget to tell you that in the image above there is an error in writting: instead of "neading" read "reading", the same is with "nead" which stands of course for "read". and "preservad" for "preserved", but these spelling errors are not so much significant since every English reader should not have a problem to understand the text.